هدف این پژوهش که به شیوه اسنادی صورت گرفته، مطالعه نقش رسانه‌ها در بازنمایی مناطق مقصد و همچنین پیوند بین گردشگری و رسانه از دیدگاه‌های مختلف بوده است. در بحث توسعه چارچوب برای مطالعه گردشگری و رسانه، روزنامه‌نگاری گردشگری و مفاهیم کلیدی آن شامل زمان‌بندی، قدرت و هویت و تجارب و پدیدارشناسی و همچنین در بخش دیگری رویکردهای بررسی گردشگری و رسانه از دیدگاه‌های بازاریابی، تأثیرات رسانه‌ای، جامعه‌شناختی و فرهنگی‌ـ انتقادی مورد توجه قرار گرفته و سپس بحث فیلم‌های محرک گردشگری به عنوان جنبه‌ای از گردشگری فرهنگی معرفی و در نهایت، درباره توسعه صنعت گردشگری در ایران پیشنهادهایی ارائه شده است. This research, carried out based on a documentary method, aims to study the role of media in representation of tourist attractions as well as the bond between tourism and media from different aspects. In the field of development of a framework for tourism and media, the field of Tourism Journalism and its related concepts including, timing, power, identity, experience and phenomenology, as well as the approaches to exploring tourism and media from the viewpoint of marketing, media impacts, as well as sociological, cultural and critical aspects are all addressed in the article. The article introduces the films promoting tourism industry as an aspect of cultural tourism and finally, puts forward suggestions on how to develop tourism industry in Iran. 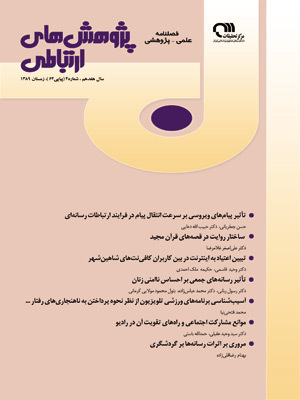 حیدری، اصغر. (1384). نقش رسانه‌ها در شناسایی مقاصد گردشگران ایرانی و خارجی. پیش شماره دوماهنامه تخصصی مطالعات رسانه‌ای. تهران: دانشگاه آزاد اسلامی واحد علوم و تحقیقات. رضوانی، علی‌اصغر. (1374). جغرافیا و صنعت گردشگری. تهران:‌ انتشارات دانشگاه پیام نور. رهنمایی، محمد‌تقی. (بی تا). طرح جامع گردشگری استان اردبیل.ج 1، تهران:‌ انتشارات دانشگاه تهران، مؤسسه جغرافیا. زمانی فراهانی، حمیرا. (1379). صنعت گردشگری و خدمات مسافرتی. تهران: زهد. فیض‌بخش، هوشنگ. (1375). صنعت جهانگردی در ایران و جهان. تهران:‌ مدرسه عالی خدمات جهانگردی و اطلاعات. لومسدن، لس. (1380). بازاریابی گردشگری (ترجمه ابراهیم گوهریان). چاپ اول، تهران:‌ دفتر پژوهش‌های فرهنگی. Balasubramanian, S.K. (1994). Beyond Advertising and Publicity; Hybrid Messages and Public Policy Issues. Journal of Advertising, 23 (4): 29-47. Bolan, P. & Davidson, K. (2005). Film Induced Tourism in Ireland: Exploring the Potential, Tourism & Hospitality in Ireland Conference, University of Ulster, June. Busby, G. & Klug, J. (2001). Movie-induced Tourism: The Challenge of Measurement and other Issues, Journal of Vacation Marketing, Vol 7, No.4. Butler, R. (1990). The Influence of the Media in Shaping International Tourist Patterns. Tourism Recreation Research, 15 (2). Cohen, E. (1972). Toward a Sociology of International Tourism. Social Research, Vol. 3. Dann, G. (1996). The Language of Tourism - A Sociolinguistic Perspective. Wallingford Oxon: CAB International. Daye, M. (2007). Developing a Framework for the Study of Tourism and the media.Culture, Tourism and the Media. Nottingham University Business School. Echtner, C.M. and J.R.B. Ritchie. (1991) The Meaning and Measurement of Destination Image, Journal of Tourism Studies. 2 (2). Fenton, D.M., Young, M. and Johnson, V.Y. (1998). Re-presenting the Great Barrier Reef to Tourists: Implications for Tourist Experience and Evaluation of Coral Reef Environments. Leisure Sciences, 20 (1). Fursich, E. and Kavoori, A.P. (2001). Mapping a Critical Framework for the Study of Travel Journalism. International Journal of Cultural Studies, 4 (2). Grihault, N. (2003). Film Tourism - The Global Picture. Travel and Tourism Analyst, October. Lawson, F. and Baud-Bovy M. (1977). Tourism and Recreational Development. London: Architectural Press. Lefevere, H. (1991). The Production of Space. London: Blackwell. Mercille, J. (2005). Media Effect on Image: The Case of Tibet. Annals of Tourism Research, 32 (4). Regan, M. (2000). The Use of Image in Tourism Destination Marketing, in J. Ruddy and S. Flanagan (eds). Tourism Destination Marketing: Gaining the Competitive Edge. Dublin:Tourism Research Centre, Dublin Institute of Technology. Schama, S. (1996). Landscape and Memory. London: Fontana. Silverstone, R. (1999). Why Study the Media ? London: Sage. Urry, J. (2002). The Tourist Gaze (2nd edition). London: Sage. The Oxford Dictionary of English Proverbs. (1970). By Simpson, William George Smith, USA: Oxford University. The Webster Dictionary of English word. (1973). London: Sage.